The book’s appendix lists all films screened by Nixon during his presidency. Was it an omen? Richard Nixon and the film industry arrived in Southern California in the same year, 1913. As Mark Feeney relates in this unusual and unusually absorbing book, Nixon and the movies have shared a long and complex history. Some of that history—the president’s multiple screenings of Patton before and during the invasion of Cambodia, or Oliver Stone’s Nixon—is well known. Yet much more is not. How many are aware, for example, that Nixon was an enthusiastic filmgoer who watched more than five hundred movies during his presidency? Nixon at the Movies takes a new and often revelatory approach to looking at Nixon’s career—and Hollywood’s. From the obvious (All the President’s Men) to the less so (Elvis Presley movies and Nixon’s relationship to ’60s youth culture) to several onscreen "alternate" Nixons (Fred MacMurray in Double Indemnity, Tony Curtis in The Sweet Smell of Success, Gene Hackman in The Conversation), Feeney sees aspects of Nixon’s character, and the nation’s, refracted and reimagined in film. Conversely, Feeney argues that Nixon can help us see the movies in a new light, making a strong case for Nixon as the movies’ tutelary deity during the early ’70s, playing a role in Hollywood’s Silver Age comparable to FDR’s during its Golden Age. Stylishly written and bracingly eclectic, Nixon at the Movies draws on biography, politics, cultural history, and film criticism to show just how deeply in the twentieth-century American grain lies the pair of seemingly incongruous nouns in its title. As Nixon once remarked to Garry Wills: "Isn’t that a hell of a thing, that the fate of a great country can depend on camera angles?" "Nixon at the Movies hits home from the start, when Mark Feeney draws out the Nixon in Fred MacMurray’s Walter Neff in Double Indemnity--as for the rest of the book he will, along with countless other characters, draw the Neff out of Nixon. Feeney is as playful as he is determined, and this book is as infectious as David Thomson’s Biographical Dictionary of Film--and as like-minded people disagree over movies more than anything else, people will be arguing over Nixon at the Movies as much as, for more than half a century, the country at large has been arguing about Nixon." "Movies and Richard Milhous Nixon can each tell us a lot about America. In this sui generis study--combining film analysis, social history, psychological observation, and political biography--Mark Feeney reminds us that Nixon and the movies can also tell us a lot about each other. It will take further decades fully to understand the subliminal life of RMN. Here’s a great beginning." 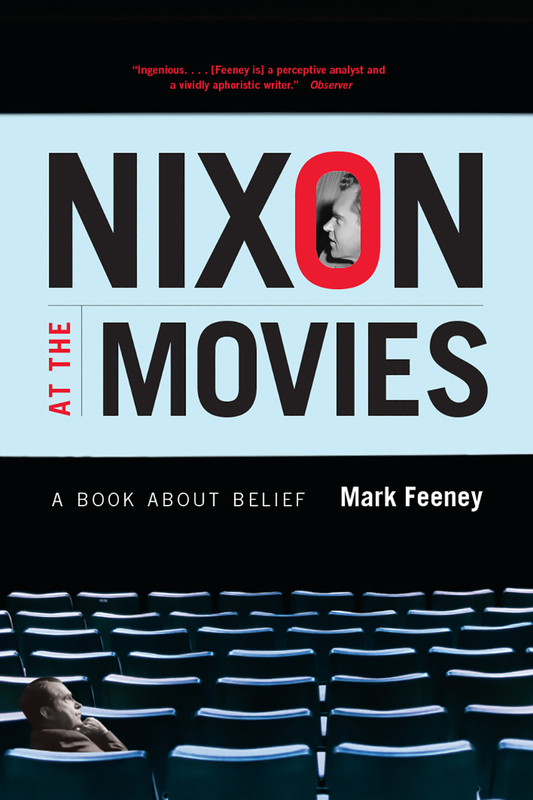 "In Nixon at the Movies, Mark Feeney has given us a thought-provoking and truly original book--a work filled with incisive insights into a fascinating figure." "Feeney bases his study on the little-known fact that Nixon, all his life, was an avid moviegoer. Like the rest of us, he formed his idea of America from the silver screen. By the same token, a number of American films provide the best explanation of Nixon. Feeney’s book, therefore, is a study not only of his protagonist but of America, as well. . . . Feeney’s book is lucid, well-argued and full of fascinating details." "It’s not surprising . . . that the 37th U.S. president most often figures in cinema not as a character but as a touchstone of an era of frustration and corruption in which the American Dream seemed to be grinding to a halt. . . . Thankfully, Feeney doesn’t focus narrowly on Nixon in the movies, so he never gets bogged down explaining the symbolism obvious in some of these films. Instead, Feeney construes his subject far more broadly -- hence, Nixon at the movies. Feeney uses many films in which Nixon isn’t referenced at all, from Double Indemnity to The Conversation, as lenses for interpreting the president and his times. And most originally, he ponders Nixon’s infatuation with the silver screen, revealing the loner president to be a compulsive moviegoer who watched more than 500 pictures while in office." "Mark Feeney’s Nixon at the Movies shows us how movie images, themes and myths reverberate with the biography of one of America’s most enigmatic presidents. . . . It’s a truly inspired idea: examining the connection between the devious, uptight Richard Milhous Nixon, the man who wore wingtips at the beach, and the glittery, greedy, glamorous movies." "Mark Feeney, a reporter and editor at the Boston Globe, takes up the 37th president’s fondness for the silver screen in his very readable Nixon at the Movies, which is somewhat mysteriously subtitled A Book About Belief. Mr. Feeney’s theme, however, is far wider than Nixon and the films he watched, as surprisingly interesting and entertaining as that subject turns out to be in Mr. Feeney’s hands. . . . Rather, the author uses the movies and the president as the basis for a broader look at America and its history in Nixon’s time, a very big subject indeed. Nixon at the Movies becomes a social and cultural history of the United States in the mid-20th century." "Feeney is the former literary editor of the Boston Globe, and is not only thoroughly conversant with the cinema, but with American popular entertainment generally. He has also made himself familiar with every word written by and about Nixon, and the eleven closely packed chapters of Nixon at the Movies juxtaposes different stages of the man’s fascinating career with a series of "alternate [sic] Nixons" as presented by various films and film stars, the majority of them from the period 1940-70. . . . Throughout this audacious book, one comparison or analogy brings up another in such a manner as to invite re-reading. What may be called Nixon’s Hollywood years have been made memorable by the creative fantasies of Mark Feeney, right there with him at the movies.--William H. Prichard, Times Literary Supplement"
"Formidably intelligent analyses of some key episodes and themes from Richard Nixon’s life. . . . ’Nixon at the Movies’ is not a book to be judged by the coherence or originality of its argument but by the quality of its performance. . . . There are brilliant star turns here, as when Feeney likens Nixon to the director Frank Capra." "A gloriously offbeat examination of how movie images, themes, and myths reverberate with the biography of one of America’s most enigmatic presidents." "Exploiting the most recent scholarship on US political culture and connecting this learning with perceptive readings of scores of popular films, Feeney captures both the spectacle and the pathos associated with Nixon’s rise and fall. Alongside Gary Wills’s Nixon Agonistes, this work merits a place as one of the two most insightful books yet written on a character who never ceases to fascinate."